(Photo: WCC / Naveen Qayyum)World Council of Churches general secretary Olav Fykse Tveit during a visit to South Sudan 02 April 24, 2013 meets with local church leaders, representatives of Muslim communities and state officials in the capital Juba. "Our country is gripped by a humanitarian crisis, and famine has now been officially declared," said a statement released by the South Sudan Council of Churches, an ecumenical body encompassing all the traditions in the mainly Christian nation of some 13 million people. It was signed by SSCC chair, Rev. Peter Gai Lual Marrow, moderator of the Presbyterian Church of South Sudan and Father James Oyet Latansio, general secretary of the council, who is a Roman Catholic. "This is an appeal for prayers, support, strong and responsible leadership and effective humanitarian assistance. The elements that gave us nationhood are needed to save the nation at this time," Latansio told the World Council of Churches on 2 March. "Millions of people have been affected, with large numbers displaced from their homes and many fleeing to neighboring countries where they are facing terrible hardships in refugee camps" says the SSCC. After gaining independence from Sudan in 2011, South Sudan was a land of hope, but since 2014 internal fighting has threatened the unity of the world's newest nation. The International Committee of the Red Cross said on 24 February "armed conflict...has forced millions to repeatedly flee their homes, leaving behind everything they have," after the World Food Program had announced days earlier that UN agencies warn that almost 5 million people urgently need food, agriculture and nutrition assistance. The U.N. Office for the Coordination of Humanitarian Affairs estimates that nearly 2 million people are internally displaced in South Sudan. The SSCC said, "We appeal to the international community and friends of the people of South Sudan to provide immediate and large-scale assistance." "But we also appeal to the warring parties to stop the war, to stop harassing our people, to stop the looting of food, and to open credible humanitarian corridors to allow both people and relief commodities to the most needy areas....Our people are struggling simply to survive." South Sudan gained gained 98 percent of its revenues from oil on its independence five-and-a-half years ago, but this tumbled by more than half and the country is battling with severe inflation. The church leaders reiterated the observations of the United Nations and other observers, "While there have been poor rains in many parts of the country, there is no doubt that this famine is manmade, due to insecurity, civil conflict and poor economic management." 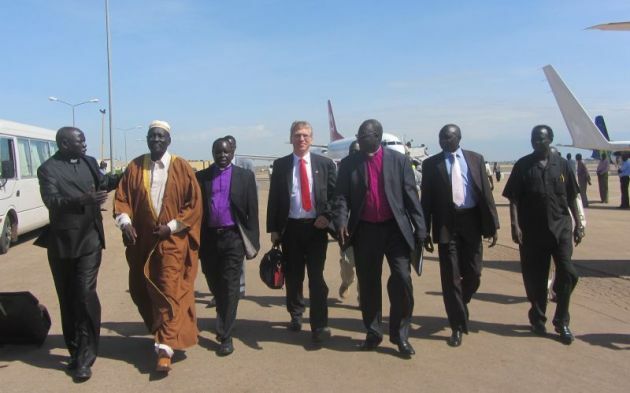 They quoted the words of Justin Welby: "We stand prayerfully alongside the South Sudanese people and their leaders," and noted that Pope Francis has said it is time now to provide "concrete food aid" for the South Sudanese.